As you might already know, Pura means “temple” in Indonesian. And while Batu Bolong might not be the biggest or the most impressive one out there, it looks like a divine shrine at sunset. I’d highly recommend checking it out early in the morning, especially if a significant other is accompanying you on this trip. 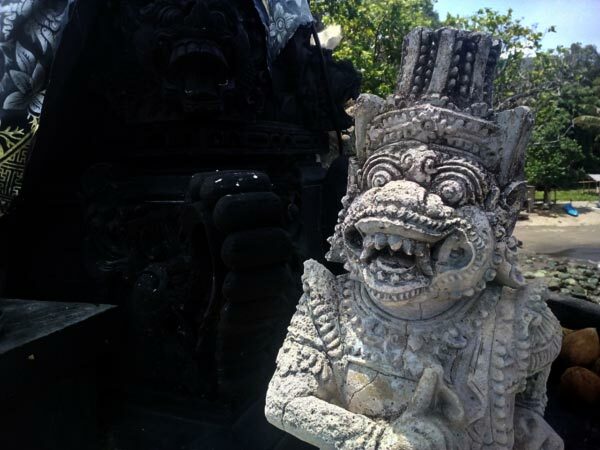 The hard-boiled tourists from all over the world are calling the Batu Bolong temple Lombok’s pride and joy and the most attractive Hindu temple. So, if you’re after that “true” experience and want your adventure on the island to be memorable, make sure to give this fine temple the credit it deserves by paying a visit and learning more about it from my article. Now, even though the majority of Lombok’s population are the Sasak people (and they are all Muslims), the Hindu people managed to introduce a huge part of their culture to the island. Today, the Balinese community is very friendly and welcoming, which is a huge plus for the visitors. By the way, there’s a rock at the bottom of the temple, and there’s a huge hole inside of it. That’s how it got its name: Batu Bolong translates as “the rock with a hole”. The locals have a beautiful tradition of leaving tiny offerings at every single one of the fourteen altars that cover a volcanic outcrop near the picturesque sea. You’ll be amazed by the view once you get there and see it with your own eyes. If you’re one of those die-hard fans of traveling and have been to pretty much every significant tourist spot in Indonesia, I bet you’ll still find this landmark quite exciting. The thing is – most visitors only know about the Sasak culture and prefer to check it out while leaving the majestic Hindu heritage behind. Even though both religions and cultures are all about praising the gods and thanking them for the gifts of life, there are many differences between the two. Pura Batu Bolong is, without a doubt, one of the finest temples in Lombok. Please remember that you’ll be required to wear a traditional sash before stepping foot into the sacred temple. Where do you get one of those? Right at the entrance, of course. Technically, you can have it for free, but folks usually make small donations – it’s customary. A quick tip: the best time to visit is during the multiple Hindu festivals and celebrations. That way, you’ll get the full experience and have a chance to learn new things about these people and their way of life. The nights of the full and dark moons are perfect for that. Just make sure you follow the rules . When it comes to the overall structure of the Batu Bolong Temple, it’s worth mentioning that it’s a bit different from what you’ll find elsewhere in Bali. Some folks claim that it’s because of the strong influence of the Sasak people. Officially, the Senggigi Beach in the West Nusa province is considered to be one of the most beautiful and magnificent places on our planet. The sunsets here are, indeed, life-changing, and the near-perfect climate is a God-sent. The temple sits on a rock and offers an even better view of the sea and the surrounding areas. If you’re all about connecting with the island and feeling one with nature, Batu Bolong will be your new favorite spot. The waves hitting the mighty rocks, the sea breeze rushing through the temple, and the “songs” of the birds create the most beautiful sound to one’s ears, turning the temple into a truly divine place. You don’t even have to do anything: just find a quiet spot where you can “hide” and watch the locals do their thing. There’s an ancient bridge that connects the temple to the mainland – it’s the only way to get to Batu Bolong. The entrance fee is more than fair – about 30K IDR, which is +/- 2.20 US dollars. Usually, it’s open to visitors since 8 in the morning and the gates are closed at 7 pm. Make sure to get an update of that from the locals so that your trip doesn’t turn into a disappointment. Because of the popularity of the beach, you won’t have any problem with the facilities and/or accommodations. There are tons of options in this area, starting with some basic-yet-cheap hostels all the way up to luxury-level resorts. It all comes down to the thickness of your wallet and the amount of money you’re ready to spend on this trip. Getting hungry from all that walking and sightseeing? Well, the beach is literally covered with food stalls and vendors – they are on every step of the way. All of that might a problem elsewhere in Lombok, but not on this beach. The unbelievably beautiful scenery around the temple will get you in the right mood for enjoying this trip. The majority of the tourists prefer to go swimming, diving, surfing and do other water sports before entering the temple. The waters are calm, which makes the beach a perfect place to hang out with your family/loved ones. Or, better yet, take a boat ride when the sun goes down – it will be magical! The local bars and restaurants will help you relax and get “hyped up” for visiting the Batu Bolong temple. As one of the greatest landmarks of Indonesia, a country with a population of over 260 million people, the beach is almost always full of visitors. At the same time, the temple is pretty tiny and “intimate”, especially compared to some of the famous Sasak temples. The fans of the Hindu architecture will, most certainly, find it all kinds of captivating. According to a creepy legend, back in the day, the locals used to sacrifice virgin girls to the sea so that it would protect the rest of the population from disasters. Can you see the highest point of the temple’s outcrop? That’s where the poor souls were taken before being pushed into the sea. The closer you get to the famous ‘hole in the rock’, the more you’ll be challenged by the sea that’s surging through the rocky terrain. From the very bottom of the Batu Bolong Temple, it is a sixteen-step climb to the top. Once there, you’ll be stoked by the mesmerizing view. As you’ve already gathered from this article, Pura Batu Bolong is a sacred temple for the Hindu people. There’s something supernatural about this place, and it’s been around for quite a while, serving as a place where the religious folks pray and worship their gods. It goes without saying that once you enter the temple, you must behave yourself. Yes, the men and women in Lombok are very friendly and indulgent, but when it comes to their traditions and sacred temples, they won’t tolerate any disrespect. So, try not to do anything stupid when visiting, like making loud noises or laughing with your friends while taking pictures (it’s not forbidden) and acting a fool . As we already established, the enchanting Batu Bolong Temple is located on a series of rocks near the Senggigi Beach, right next to the city of Mataram (West Lombok, West Nusa Tenggara Province, Indonesia). Again, this heavenly beach is a very popular tourist spot and you’ll probably meet a lot of foreigners once you get there. The locals usually visit the temple to pray, while the tourists just want to do some sightseeing and take tons of pics to post on their social media (like Instagram). The distance from the city to the temple is only 12 kilometers, and you’ll be able to get to your destination in less than 10 minutes. If you want the exact address to type into your GPS, here it is: Jalan Raya Senggigi, Batu Layar, Denpasar, Kabupaten Lombok Barat, Nusa Tenggara Bar. 83355. Keep in mind, however, that GPS might not be available in certain areas, so, rely only on your own self unless you want to hire a guide. Thankfully, the road is straight and there’s literally no way you’ll get lost. The sea on the left will guide you. Public transportation/taxi is also available. So, if you want to admire the view while on the road, hop on a local bus. At the same time, driving a vehicle/bike into the sunset is also all kinds of awesome. During spring, the beach will be least occupied by tourists. So if you want an intimate experience, it would be best to travel there during the March-May period. That's what I gathered from my own trip - might be different for you. Thanks for telling us about the tradition of wearing "scarfs" for the temple. We got a couple of those for 4.5 dollars and were allowed to enter. Did you know that the locals built the temple back in the 15th century? It was supposed to protect the children and show the men and the women the right way. The road from Mataram to the beach is truly magnificent! Even though the temple is awesome, I personally liked the beach more. It's so peaceful and beautiful that you just want to stay there for eternity.